20-Apr-2009 -- This seemed like an easy visit. We stopped about 340 m southwest of the cp at a parking facility (for a local yacht club) and walked along a bicycle track to about 125 m from the cp. 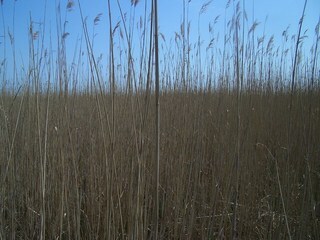 We crossed a railway track, some shrubs and entered the reeds which grow along lake Balaton in this area. A few meters into the reeds the ground was getting wet, then soggy and then the only the odd grass tuft here and there. At 96 m I settled for that distance as the grass below my feet slowly sank into the water as I stretched up to the take the required photos above the reed. By the time the pictures were taken I was half way up to the knees in water. Next stop was Interspar near Keszthely buying new footware. Ps. While putting in the photos in this report I see that the date and time on my GPS are completely off. I was there on 20 April 2009 just after noon. My only excuse is finger trouble while I was sinking into the water.